Here you see a horoscope for the time (4:45 pm est), date (July 28, 1932), and location (Anacostia, near District of Columbia) that the Bonus Army of our nation's unpaid WWI veterans and their families, who'd marched on Washington to demand that their bonuses be paid, was charged by Major General Douglas MacArthur leading infantry, cavalry, and six battle tanks commanded by Major George S. Patton. Yes, it's our two main American heroes active at a 1% v 99%-style stand-off in the olden days of 1932, with the military and police forces doing the dirty work of a resentful, crisis-ridden White House administration that went on to lose its next bid for the Oval Office to Democrat Franklin Delano Roosevelt. The violent behavior of the US government toward American citizens who were free to dissent and were feeling betrayed financially after risking their lives in service to our country--and were hungry, as were their wives and children--is all too similar to the police brutality being used these days since the Occupy Wall Street, or 99% Movement, began on September 17, 2011...brutality used on peaceful demonstrators who want We the People's grievances redressed. How positively unAmerican of the US government, then and now! Bonus Army Charged by MacArthur @ 4:45 pm est July 28, 1932 Anacostia, District of Columbia; Hour of the Sun; Moon (the people) and Mars (police; military; males between ages of 25--35 appr) are out-of-bounds and performing unusual feats--Moon OOBs indicates a populace feeling unstable, disregarded, and unfed due to being unpaid though granted the privilege by congressional action for their WWI service. This horoscope shows Sun and Moon in 3rd quarter phase (crisis in consciousness); Neptune in Virgo--as is US natal Neptune--is in detriment in Virgo since opposite is Pisces, co-ruled by opaque, misty, diffusing, confusing, often deceptive Neptune. 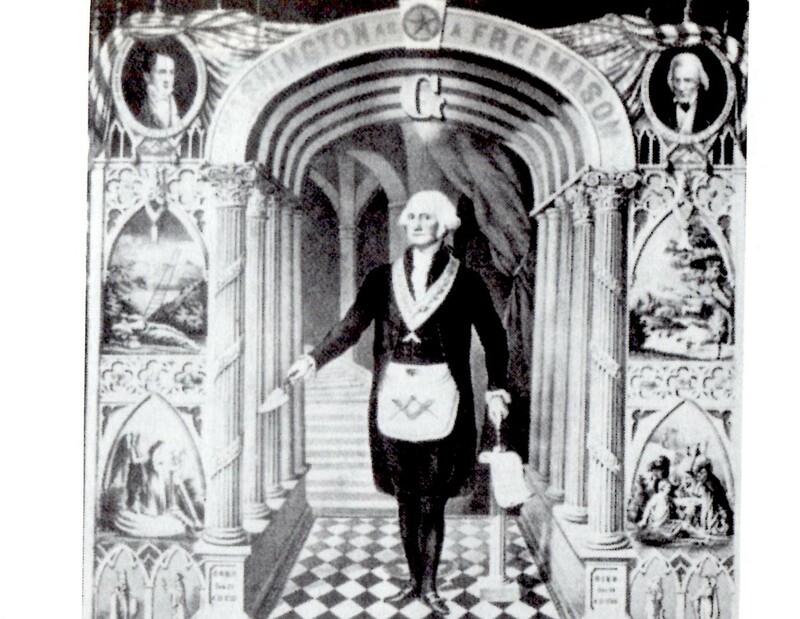 The Neptunian tactic of fraud comes to mind, then as well as now; Sun conjoins America's natal North Node 5Leo+ which emphasizes the importance of the president's destiny which he could've handled very differently than by attacking US citizens. 1. a crisis-ridden, turning-point heralding YOD pattern--a sextile (60 degr) between Mercury and Venus 00Can06, a World point of Manifestation, at its base and pointing toward the man in charge, Saturn @1AQ06 Rx. 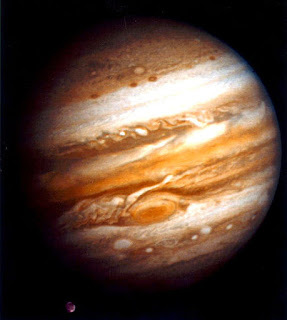 Saturn at apex of a YOD configuration has a karmic (reap what was sown) flavor and is discussed just below. Apex Saturn in a YOD formation shows one (or those) who should not use force unwisely, yet as we know, this Saturnian caution was not heeded by Hoover, hence the fated or karmic undertone in the chart. "This is a testing YOD," says Saturn the lesson-bringer, and timing is all important to outcomes since fated consequences are described. Frustration (another of Saturn's favorite words) and a sense of failure may accompany this YOD if its energies are not properly (Saturn, says!) expressed. 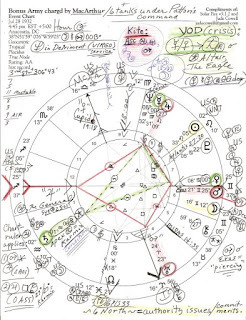 If you've seen the Occupy Wall Street natal horoscope for September 17, 2011, sunrise, you'll see Saturn 17Lib01 which conjoins the Bonus Army's Midheaven, The Goal Point of any chart. Speaking truth--Saturn--to Authority--also Saturn. And of course, all these Saturnian issues are presenting themselves underneath the auspices of our recent US Saturn Return to 14Lib48 when our nation's responsibility-accountability chickens come home to roost. This apex Saturn demands attention to social responsibilities, focused and purposeful activity, and heralds a new path that has serious implications (Dynamics of Aspect Analysis, Bil Tierney.) Yet a tendency toward self-preservation seems to have been the primary concern of the US government. 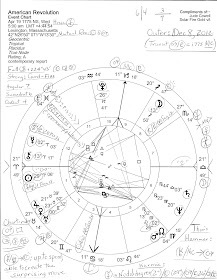 Another link to the OWS natal chart is that its Sun/Moon midpoint at sunrise falls at 21Can47 which conjoins 1932's Pluto 22Can05; other links may be noted if you'll check it out for yourself! This Pluto is lining up to oppose US natal Pluto 27Cap33 Rx, a time when great powers are locked in massive battles for control, a background influence that undergirds the whole shebang. 2. the military assault on the Bonus Army occurred during a 6 North Saros Series Solar Eclipse which had manifested on March 7, 1932 @ 16Pis33...6N themes are 'relationship to father figures; authority issues; needing to take responsibility or control; commitments through another person's not being able to carry on.' (Brady.) '17Pisces'/'17Vir' are considered critical (crisis) degrees and relate directly to the Uranus/Pluto cycle since they met there in mid-Virgo in the mid-1960s = civil rights--workers' rights--racial inequality--anti-war protests; plus, 2011's income inequality issues, tuition increases, etc. So in 1932, President Hoover and his military advisers (and international bosses) attempted to take control and had some temporary success, we might say. But it was their own sense of responsibility and their commitment to paying our war veterans that they wanted to avoid. Sounds kind of like the attitudes of Republicans in Congress circa 2011 and how they behave over such things as extending unemployment benefits, extendign corporate welfare, and a desire to institute other populace-controlling methods of austerity (Saturn!) These are some of the plutocratic strategies of globalism-loving politicians determined to keep down the oppressed and disenfranchised in America, a group whose ranks are constantly increasing. Jupiter/Neptune = Mercury: speaking for the deprived; misleading or misdirecting others; skills with deceptive practices; putting on an act; talking a lot; a raising of hopes. 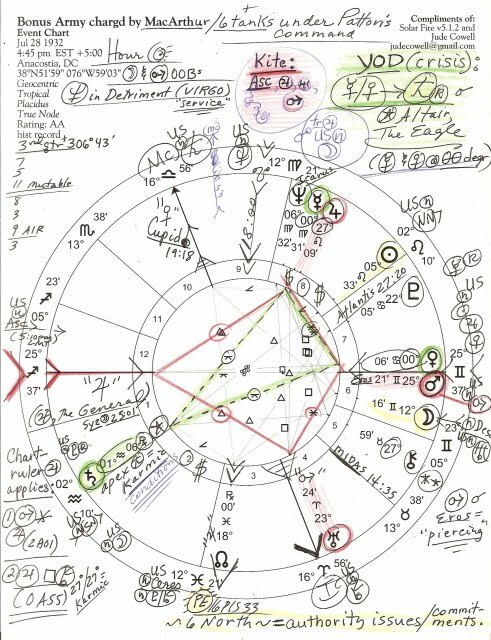 In the 1932 horoscope in the 6th house of Police and Military Service is Mars, planet of war, conflict, and protest, just beyond his Return to natal position in America's birth chart (July 4, 1776; Mars '22Gemini' square Neptune 22Vir25.) And, if you use this ASC 25Sag37 as the tail of a high-flying Kite pattern, acts as the spearhead of MacArthur's and Hoover's efforts to quell dissent in this Land of the Free, Home of the Brave. Plus, as you see, Mars 25Gem21 conjoins asteroid Eros ('the piercing') (and OWS's natal MC at sunrise!) which describes the charge of Mars--US 500 infantry, 500 cavalry, 800 policemen, and 6 tanks, as noted) toward the Bonus Army marchers who, in their gullible, patriotic love for America and pride in their military service to the US government, cheered--cheered!--because they assumed that General MacArthur was leading troops to HONOR them, our veterans of WWI.